If you choose to apply the boundary condition to the Sides of the simulation domain, click the [Next] button to select which side(s) to apply the boundary condition to. 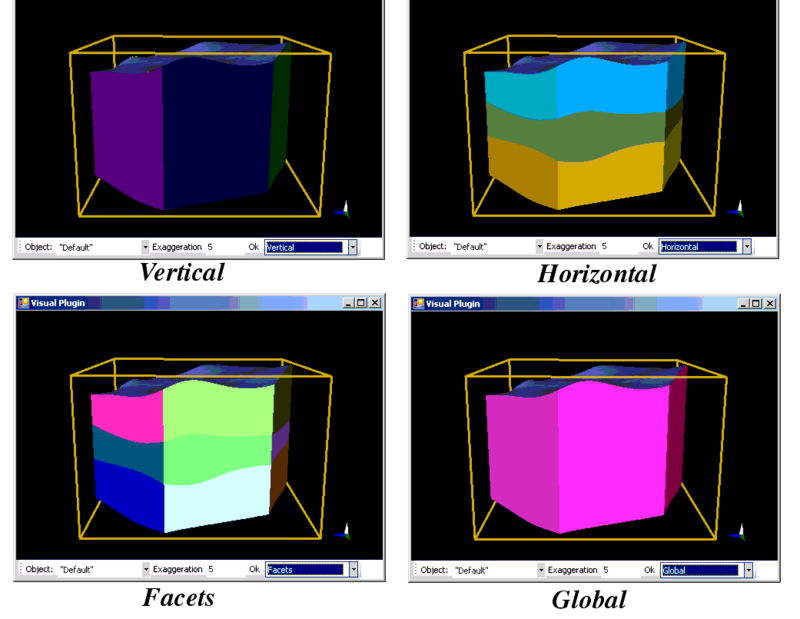 Applying boundary conditions to the sides of the simulation domain is accomplished by manually selecting the desired sides using an interactive 3D Viewer window. •Click the [Show] button to display the interactive 3D Viewer. The interactive 3D Viewer behaves just like any other 3D Viewer. You can zoom in and out, rotate and move the displayed simulation domain using your mouse. You can also change the color of the background, show/hide the axis, and change the vertical exaggeration. •Click the [Create New Zone] button. A new row will be added to the Zones table. Here you can change the zone Name and Description, as desired. •Click the [Start Selection] button. A new combo box called Selector will be added to the bottom of the interactive 3D Viewer (indicated below). •Horizontal: Select the area(s) between two horizons, around the entire simulation domain. •Vertical: Select an area(s) between two edges, spanning the entire height of the simulation domain. Using your mouse, click on the simulation domain in the 3D Viewer, and select the appropriate sides for the boundary condition. When a side is selected, it will become highlighted. You can select multiple verticals, sides, or facets by holding down the [CTRL] key on your keyboard while adding to your selection using left click(s) of your mouse. Once the desired areas have been highlighted, click the [Done Selection] button to save the selections. Repeat the steps above to create additional zones.